A free community event in Ferndown for the over 50s is being held following the huge success of a similar one in Broadstone. The Douch Family 50-plus Information Day will take place on Wednesday May 17 at the Ferndown Royal British Legion, between 10am and 2pm. 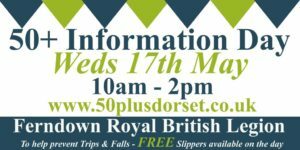 The town crier will be shouting about it and advertising what’s on offer; including free refreshment and free slippers. Firemen and POPP (Partnership for Older People) will be handing out the footwear – which by replacing an old pair of slippers with a new pair it has been proven to help prevent trips and fall in the home. Other stands will be offering a variety of goods and services from advice about financial planning to sports and leisure. There will be cooking demonstrations and there is likely to be walking football and walking netball demonstrations on St George’s Field. Emma Regan, from Douch Family Funeral Directors, said: “After our last over-50 event proved so popular we decided to hold another. “We are doing this in conjunction with the Royal British Legion and AE Jolliffe & Son will be our local supporting branch. “There is plenty of free parking available and deputy mayor Steve Lugg will be opening the event. “Town crier Mike Andrews will be walking around the town to let people know what is happening. “We have more than 30 stands with a wide variety of things on offer; there is a real mix of exhibitors. Keep up to date with this event.